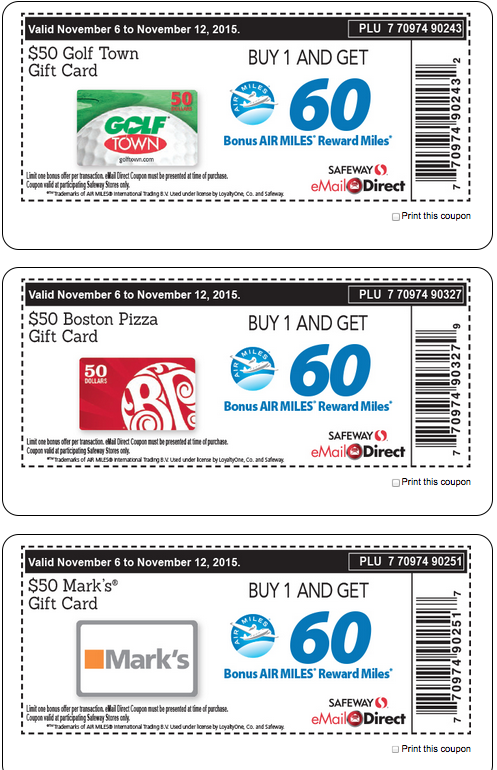 We haven't seen AIR MILES bonuses for buying gift cards at Safeway since June but this week the bonuses have returned! 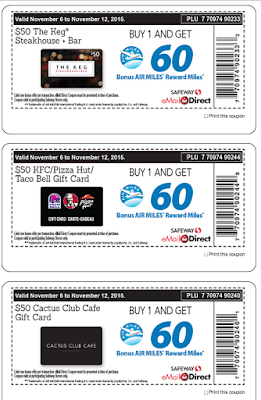 These are the same as those seen in June but aren't as good as the December offer of 70 AIR MILES per $50 card but are better than the 55 miles in November. 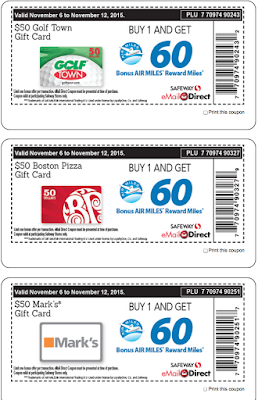 With this offer you'll earn 1.2 miles per dollar on these cards or if you work the other way, we value AIR MILES at 11 to 15 cents a piece so you are essentially earning $7.70 to $10.50 with each card. 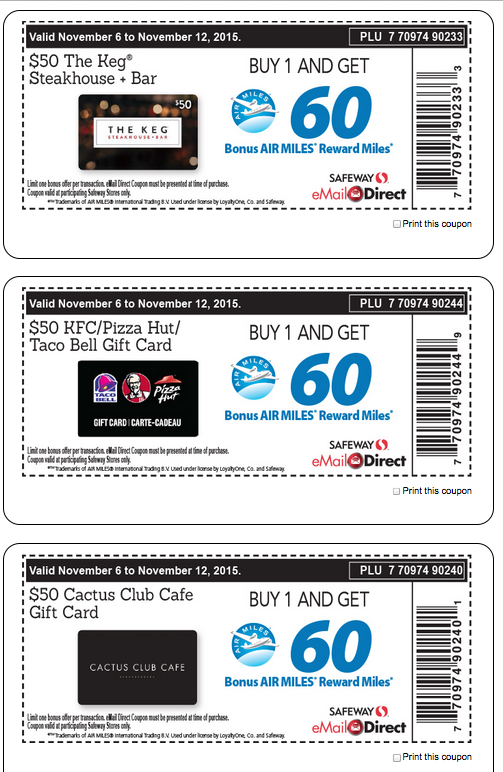 However if you look at our post from a few weeks ago about hacking the Air Miles program you'll know that you can actually get value of over 30 cents per mile on car rentals which means you can technically earn ~$18 on each these gift cards! Hint: Print multiple copies and go through the till multiple times if you want to buy more than one card for the same retailer! The merchant gift cards included are Spafinder, Bass Pro Shops, Sears, Roots, The Keg, KFC/Pizza Hut/Taco Bell Mark's, Cactus Club, Golf Town and Boston Pizza. 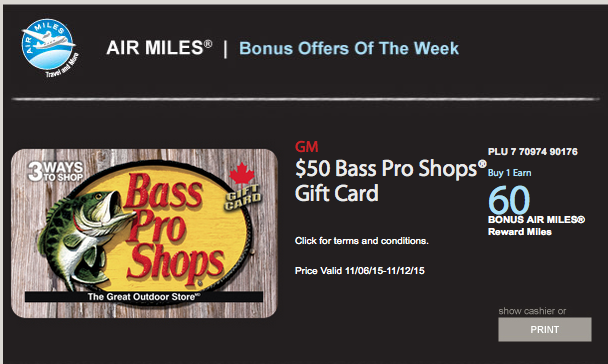 There is also an offer of 75 Bonus Air Miles when you purchase a preloaded Visa Gift Card of $200 or more. Those cards however carry an activation fee so it isn't as worth it to buy them. I bought many cards during the last few go rounds for a lot of bonus Air Miles plus the double Membership Rewards points as I purchased them on my American Express Gold Rewards card which awards 2 points per dollar spent at grocery stores. I know I'll definitely be buying the Cactus Club and Keg cards multiple times. Not sure about the rest as I don't really frequent those places that much. How about you? What cards will you jump on?